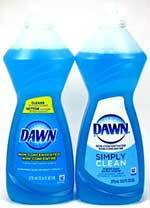 Dawn is one of the most popular dishwashing liquids on the market. It is widely used by homemade-cleaner enthusiasts as an ingredient in DIY cleaner recipes. When I first started using Dawn in my homemade cleaners, I was confused about the different varieties and colors. Is the blue better than the yellow? Is the new formula as good as the old? I will try and answer these questions for myself and my readers. This article will be an ongoing effort and will be updated as new information is discovered. We will probably not be able to learn everything we want to learn about Dawn. The main reason for this is because the exact formula for the product is a trade secret. There is no way we are going to know the exact ratio of ingredients in Dawn and how those ingredients have changed over time as old formulas were retired and new ones were introduced. We will have to rely on random tidbits of information and anecdotal evidence to try and piece together a better understanding of this product. Proctor & Gamble introduced Dawn in 1972, but only to a small test area. In 1976, Dawn was released across the entire United States. This was the original blue Dawn with original scent. In 1978, the International Bird Rescue Research Center received a grant from Chevron to test the effectiveness of dish soaps to clean oil-soaked birds. This study determined that Dawn was the best product for cutting through the oil. In 1989, after the Exxon Valdez oil spill, Dawn was used to clean up the oil-soaked birds that were victims of the spill. The original Dawn is believed by many to be a superior product to the modern Dawn. I do know that the Original formula was updated around 1987. Then in 1996, the original Dawn was taken off the market altogether. Dawn Ultra replaced the original Dawn around 1996. The Dawn Ultra product page states that it “contains double the everyday grease cleaning ingredients in every drop versus the leading non-concentrated dish soap.”In my opinion, the Ultra formula increased the amount of surfactants, which are substances that lower the surface tension of water. This decrease in surface tension allows the water to be able to interact more readily with substances we would like to remove, like oil and grease. I suspect that other ingredients, such as enzymes, were reduced or removed. Now this is not necessarily a bad thing for us. We don’t always want or need enzymes in our homemade cleaners. In the Easy Homemade Laundry Detergent recipe, the high levels of borax and washing soda might destroy the enzymes. We would possibly be wasting money if we made this homemade detergent using a more-expensive Dawn with enzymes. A very acidic homemade shower cleaner would be the same way. The acid levels in the shower cleaner would destroy the enzymes. For this reason, I prefer to use Dawn Ultra in such cleaners. Why pay for enzymes when they would be wasted? The Dawn Ultra formula has changed over time as well. I have found evidence online that the formula was updated in May 2005. Is the Blue Dawn Ultra Better? Regular Dawn Ultra comes in the blue original scent and yellow lemon scent. My opinion is that these two products are basically identical. I can’t think of any reason why the blue would work better than the yellow or vice versa. The coloring and fragrance should have no bearing on the cleaning power of the liquid. This also applies to the new Dawn Ultra Destinations which come in Mediterranean Lavender, New Zealand Springs and Thai Dragon Fruit scents. I would think that you can use any fragrance of Dawn Ultra that you like and the cleaning performance will be the same. I prefer the blue version mainly because I like the color blue and also because scent is just not that important to me when it comes to dishwashing liquid. Your dishes shouldn’t have a scent. If you can still smell perfume on your dishes after washing, then that means you didn’t rinse them enough! Not long after Dawn Ultra was introduced in 1996, Procter & Gamble released Non-Ultra Dawn. I believe the Non-Ultra formula was updated in 2004. In 2006, it was renamed to “Classic Dawn”. These versions are no longer available. Around 2009, Procter & Gamble introduced Non-Concentrated Classic Dawn. This was later changed to just Non-Concentrated Dawn. Some bottles also say “Simply Clean”. To the right you can see two different bottles of Non-Concentrated Dawn that I picked up at the same store in November 2013. I believe these two are identical liquids. Only the label is different. I do not know the exact difference between Non-Concentrated Dawn and Dawn Ultra, but I can tell you that Dawn Ultra is much stronger. I did a quick test in the sink and the difference was obvious. Even though the Non-Concentrated version is cheaper, I believe Dawn Ultra is the better buy. This version of Dawn contains the chemical chloroxylenol. This chemical is used to kill bacteria and viruses. The substance has been used in hospitals since the 1950’s. Dawn Ultra Antibacterial previously contained the chemical triclosan but that has been removed in favor of chloroxylenol. Triclosan, although used for many years in consumer products, is coming under increased scrutiny by government, health, and environmental organizations. It has already been banned in the EU and the state of Minnesota. In my opinion, chemically-enhanced antibacterial soaps are better used in medical environments such as a doctor’s office or hospitals. Although the bottles have the words “Hand Soap” on the front, I do not recommend using these anti-bacterial soaps for routine hand washing unless directed to do so by your doctor. I would not use products containing chloroxylenol to clean your fish aquarium or equipment. The EPA has stated that chloroxylenol is extremely toxic to fish. If you clean your fish tank with chloroxylenol soap, your fish might not be too happy. As of late 2016, I am aware of 5 varieties of Dawn Platinum. These are the Platinum Power Clean, Platinum Power Oxi, Platinum Bleach Alternative, Platinum Stainfighter, and Platinum Erasing Dishwashing Foam. How is Dawn Platinum different than Dawn Ultra? Remember the enzymes that I mentioned earlier? Well, these Dawn Platinum dishwashing liquids contain enzymes. These enzymes help to break down tough, cooked-on foods. What exactly is the difference between the Dawn Platinum liquids and which one should I use? I had the same questions and I think I have found a few hints that may help. According to information I gleaned from a Proctor and Gamble website, it appears that Power Clean and Bleach Alternative contain amylase enzymes. The Power Oxi, on the other hand, contains protease enzymes. Amylase enzymes break down starches and protease enzymes break down protein. This means I will be using the Power Clean for such things as pasta sauce and gravies. For cooked on cheese sauce or meats, I would go with the Power Oxi. At this time I do not have enzyme information on the Platinum Stainfighter. I don’t believe the Platinum Erasing Foam contains enzymes as it is not a product used for soaking. Platinum Power Clean is best for dried, stuck-on foods. Platinum Bleach Alternative is best for removing invisible residue from your dishes. Platinum Erasing Dish Foam is for washing without filling the sink with water. I sometimes wonder if enzyme content or lack thereof is related to why some people feel the old Dawn worked better. If you think the Original Dawn performance was better, you may want to try these new Ultra Platinum Dawns. Dawn Platinum Advanced Power is another premium formula of Dawn. The only place I know where you can buy it locally is at Costco. This product also contains enzymes. Interestingly, the stated ingredients show that this product contains both amylase and protease enzymes. This would make it a good soaking detergent as the enzymes would attack all types of foods. If we look at the label, it appears that this is in fact the intent of the manufacturer. It states “overnight soaking power in 5 minutes”. Dawn Professional, also known as Manual Pot and Pan Detergent, is the crème de la crème of the Dawn dishwashing liquid family. I have read that a lot of people like this version and that the formula is not changed around as often as the other versions. I have not been able to find the ingredient list of Dawn Professional, but when I do, I’ll let you know. Some people have said that it is similar to the Original Dawn that so many people love. What Countries is Dawn Sold In? Proctor & Gamble sells Fairy brand instead of Dawn in Australia, France, New Zealand, Spain, United Kingdom, and Ireland. Whew! This was a long post. I didn’t realize there was so much to say about Dawn Dishwashing Liquid. Please join the Home Hints Facebook Group. Just saw (early April 2014) large bottles of Advanced Power Dawn for sale in my local Costco. Don’t remember the price but it was very reasonable. I’ve noticed that “enzymes” no longer appear on the ingredients. P&G removed enzymes from all versions commonly available at the grocery store, except platinum, some time ago. Now they’ve removed it from Platinum, too. I called customer service and was told enzymes are no longer an ingredient in any Dawn product!!!! I registered my dissatisfaction. If they discontinue the Platinum products, then that will tell us something. Thanks again. I have had a cleaning business for a little over 6 years now and Dawn has become a staple in my business. Over the years I’ve tried pretty much every single cleaning product available from Clorox clean up to the $1 Totally Awesome. I learned, after spending far too much money, that if you have Totally Awesome, a green bath Magic Eraser and the ‘Simply Clean’ clear Dawn bleach alternative that you could clean an entire house for right at $5! Granted I typically use glass cleaners and stainless steel cleaners but only cause my clients would fire me on the spot if I walked in with 3 products lol I’m saying all of this because I’ve recently discovered that this specific Dawn is no longer on the market and I’m panicking! I’m wondering if anyone else has used this specific Dawn and if so have you found any of the other kinds that work as well? If anyone has any info PLEASE message me. Thank you very much! I love this article, thank you. Myself, along with hundreds of others, rely on Dawn detergent for world class gigantic soap bubbles. The information you provide herein will help other bubblers understand the product better. I have shared it to my FB page which reaches bubblers all across the globe. Thanks again! I am not a bubbler but I know that Dawn is a mixture of at least 3 different detergents or surfactants. It also contains ethanol. I think one of the detergents has a greater foaming action than SLS. The amine oxide that is added is a foam booster and stabilizer I think. Sodium lauryl sulfate by itself is irritating to the skin and causes contact dermatitis. Adding amine oxides synergistically counteracts the skin irritating properties of detergents like sodium lauryl sulfate and allows the dish detergent to be skin friendly. Back in the 1970’s, chemists discovered that mixing a nonionic detergent with an anionic detergent could yield a synergistic mixture that was better at cutting grease than either detergent could individually. The specific process was patented with Procter and Gamble as the original assignee. The patent is now expired but I believe companies still use detergent mixtures because of this grease-cutting synergy. How that synergy might relate to bubbling is unknown to me. Thank you so much for the info. I went years without using dawn as the original would cause huge amounts of skin to peel from my hands. Four or five years ago I began using it as my only laundry spot remover as most items made for that specific purpose rarely work. I’ve been using Ultra Dawn but just brought home the Platinum Dawn for the first time just because it had enzymes listed as an ingredient. I like enzymes. Enzymes = less elbow grease. Yes we too have found that it works well as a spot remover. We have started using the Homemade Shower Cleaner on tough spots with success. Sometimes it will even remove spots that have been through the dryer. Do you sell Dawn Simply clean (blue) in Holland? I contacted U.S Procter and Gamble support and they told me I would have to call the Netherlands P&G to ask this question. I can’t speak Dutch so I can only refer you to the Netherlands contact page. Can I find dawn in Italy? Where??? You will need to contact Procter and Gamble in Italy. If you call U.S. support that is where they will direct you. I believe the Italian Procter and Gamble contact page is here. My niece has a small bird and it flew into a pan of gravy. He is now full if grease and told her to wash him with dawn. She found a bottle of medditerrainian lavender in her basement. Is this suitable to use or does it have bleaches in it or anything else carrosive in it? Mediterranean Lavender is just Dawn Ultra with a different color and scent. You could use it to clean oily bird feathers. I would try to keep it out of the eyes though. Yes that is a MSDS for Dawn Professional. Procter & Gamble has updated versions of these documents here. Although the MSDS does reveal a few of the basic ingredients, there are several other ingredients that are not revealed. We still don’t know what the enzyme profile is for Dawn Professional and how it differs from Dawn Ultra. Long informative post but well worth the read (and reply’s) for those of us who wanted to know these specifics. My own successful application with the use of Blue Dawn was in my battle with a tent worm infestation in the rental property next door. A tall cherry tree. Year two. I constructed a chicken wire moat, then covered it with plastic , then filled it with water and BD. (encircled the tree trunk-circumference about 25′) Thousands of worm died. Thousands of others went down using a spray bottle of water and BD. I hope they will remove this tree by next worm season. I appreciate the posts and information but what it comes down to is that Dawn is no longer the same product I have been using over the years. No matter what formula they make it does not cut the grease. I am at least glad to know I was not imagining the difference, I no longer will be purchasing their product . Their customers as you can see by their post have been loyal over the years and obviously that loyalty has not been returned. It is not about quality to them only money. We do not need five different versions just stick with the old. Why mess with what works. We too have found that the quality of Dawn Ultra – original scent has changed. It is less viscous and also has less sudsing/staying power. It is unfortunate that P&G felt they needed to changed the formula; it was a great product. There is a new Dawn Platinum called Stainfighter. It says on the front label that it “Powers away stains in SECONDS”. Is the Dawn Ultra Platinum safe for our environment? I have been washing my dishes in a plastic basin and then when done with my dishes I pour it all on my backyard grass. I am trying to be careful not to waste water or contaminate the ground. Also, I have dogs, cats and feed birds in my backyard. According to the Dawn Ultra Platinum MSDS, Section XII Ecological Information, all of the surfactants are biodegradable. I don’t think you have anything to worry about. Hello. I work at an animal shelter and we use Dawn for both cleaning the facility and cleaning the animals sometimes. We’ve been using the blue Dawn Ultra but I can get a better price on the “Manual Pat and Pan” (professional) formula. The Dawn ultra is gentle for sensitive kittens. Anyone know if the Professional formula would be as well? I compared the MSDS for both products. The biggest difference I saw was that Dawn Ultra had higher amounts of the listed hazardous ingredients. So the Dawn Professional looks like it is as safe if not even safer than Dawn Ultra. I often foster kittens and the mother cat. They often have a bad case of fleas when they arrive. Dawn works great to clean them up and seems to kill the fleas almost instantly! Just be sure to keep the bathroom really warm and use two people so one person can towel them off while another washes them because they can get dangerously cold very quickly. Also keep it out of their eyes mouth and nose! If it kills any living thing easily it is harmful to humans as well. 409 kills wasps and spiders immediately. Rinse skin off immediately every time. Wonder where cancer comes from? Cleaning chemicals. Use lemons, baking soda, salt, vinegar and the like whenever possible. How safe for septics? It only kills insects because it interferes with their breathing process. It actually chokes them to death. It is not a poison that reacts to their system. If you spray it on your plants be sure to hose the plants off with clear water after about one half hour. Since Dawn changed its packaging, the Dawn Ultra seems ‘diluted’, both in viscosity and what I would call washing strength or ability to last long enough to wash several dishes (some people might consider those 2 different characteristics). I haven’t noticed the diminished ability to cut grease as stated in a previous post. However, it seems we now use 50% more to clean the exact same dishes we did just a year ago. This is an unfortunate discovery. Why won’t P&G own up to changing it? Since buying the large bottle of Dawn Ultra(Advanced Power) my skin has become extremely dry to the point of being painful. This morning, I realized the problem has been since starting to use the Dawn on a regular basis. Have been using Dawn products since before the Valdez incident with never a problem-until now. Will be returning the second bottle I bought, as I usually buy two at a time. Will continue to use the Dawn listed as Hand Soap and forget about the ones listed as Dishwashing Liquid. Dawn is designed to strip oil and grease. It can also strip the natural oils out of your skin. Many people find that they must wear dishwashing gloves to prevent this. Thanks for the great info. My bottle from Costco, the Ultra Platinum Advanced Power has enzymes. Just made some laundry spot remover with this and hydrogen peroxide. Thanks for the great info. I don’t know for sure but my best guess is that they are very similar. Thanks for your time and efforts for your infomation on the history and characters of all the Dawns. For years, the Dawn original was what I stayed faithful too. Then out of the ‘blue’ a few weeks ago I decided to try the Dawn Platinum and got hooked on it. I decided to see what info was out there on Dawn and got your site and was amazed. I will try the Ultra Platinum Advanced and I am almost sure that this will be as far as I am straying away from the Original Dawn (Platinum/Ultra Platinum). Thank you for the fascinating information. I personally like the Dawn ultra PLATINUM STAINFIGHTER! I don’t care too much, if it has enzymes in it or not! It’s the BEST I have found for my needs. However, I was surprised and disappointed, when I went to our local Safeway in Alameda, CA yesterday to purchase a backup bottle, and discovered none on the shelf, PLUS NO SHELF SPACE REPLACE STOCK IF IT WAS JUST OUT OF STOCK! Unfortunately, our Safeway, in spite of Being the SECOND LARGEST SAFEWAY STORE IN CA, IT’S HUGE! Has been discounting several other items that I like and miss! We use Dawn to wash our dogs. I heard it also kills fleas. Do you know if that is true? I believe it will kill fleas. However, I would not use it as a shampoo on a regular basis. The strong detergents will strip the natural oils from the dog’s skin, possibly causing skin problems. Occasional use on a very dirty dog might be ok. Instead, I would use a proper dog shampoo and then apply a topical spot-on treatment for long-lasting flea protection. I bought Dawn non-concentrated this week from Walmart. I saw immediately that it was far less concentrated than the product I had ordinarily bought at SAMS and it did not clean my dishes as well, especially greasy pans. I thought that Dawn had watered it down like so many things available now at the grocery store. Companies are making inferior products and smaller packaging, but charging more. I am so disappointed! We hear there is no inflation, but there truly is, it is just sneaky product development! I was wondering myself why many cleaning recipes and remedies mentioned blue dawn specifically, and now I’ve figured it out. It’s important to note that while the different colors and scents may all perform the same on dirty dishes, other ingredients are required to get make those seemingly aesthetic changes in the formula. This means the addition of things such as lemon or lavender or whatever other essential oils. When it comes to animals, lemon is toxic to both cats and dogs if ingested, as are other essential oils like lavender- especially to cats. Dogs are a little more tolerant because they don’t lick their fur as much as cats. Other kinds of animals are very likely to have their own sensitivities to these ingredients. Thanks for the information. I keep seeing cleaning recipes specifically saying to use blue Dawn. I used to use it Canada before moving to Australia. We dont have Dawn here so I will give Fairy a go. I have a feeling it will be different. Thanks so much for the Dawn history lesson. You and your commenters touched on several good points. Some folks feel that the product (whichever version of Dawn) is less effective than it used to be. As a former dutiful corporate wife, I came to understand several corporate truisms. The first and foremost of which is that the product must make at least a certain profit margin for it to be worth the company’s efforts. Formulas are constantly reviewed to see if new information can substitute cheaper ingredients with little or no perceptible consequences. That “new and improved” formula may not be improved for you the customer at all. It may only increase or maintain the current profit margin on a product. If the performance of that product is minimally affected, customers may not notice and will become accustomed to the lesser quality. The story continues with consecutive modifications until the product finally falls out of favor with the buying public to the extent that the profit margin narrows beyond the corporation’s tolerance level. Then the product disappears from store shelves . Another reason ingredients change is that some fall out of favor with consumers and/or government agencies. If there are serious consequences or risks, either to humans or the environment, corporations do not want to risk the potential legal and financial exposure. What consumers must keep in mind is that for a product like a dish detergent to work super fast is must be pretty strong and most likely will have side effects that may or may not be desirable. Hence the mantra: if a product is that powerful, it is probably too powerful to use safely. A detergent’s ability can be enhanced by using hotter water and/or letting the product have time to do its thing. Additionally, something as simple as a sprinkle of baking soda on a wet dish left to sit for a few hours can much more safely cut through baked on foods. The baking soda slowly breaks down the chemical bonds between the dish and the food. Then the grit helps to remove the last bits. . . . .skin saved, less of a stress on the environment, money saved and dishes clean. Yet another consideration is the idea of antibacterial detergent. The idea is good, until you look at the elements of its use. First keep in mind that any soap or detergent and hot water is naturally antibiotic. Antibiotics only increase this affect by around 1.5%. That might seem desireable until we look at what happens when we use antibiotic soaps and detergents. Detergents by their nature remove natural oils from our skin that causes drying and microscopic cracks and fissures in the skin that are awesome places for bacteria and germs to hide. Antibiotics in the detergent increase this effect and consequently counteract their own purposes. Advertising and consumers’ good intentions keep these items on the shelves, not results. Regular liquid bath soap probably does a better job than antibacterial bath soaps for just this reason. If you are still concerned about germs beyond what hot water and regular dish detergents can do, run a pan of rinse water and add a capful of chlorine bleach to it. Local health departments have been recommending this for years for at risk clients. Those of us who live in hurricane territory know we can rely on this when we have no hot water. Lastly I would like to address hidden price increases. When a product becomes cheaper to manufacture and the price does not reflect this, it is one of the many forms of hidden price increases. If that container suddenly has less product and the price does not go down, it is a hidden price increase. If the toilet paper roll seems smaller, or if the toilet paper tube is bigger diameter, you can bet that your product just got more expensive. No toilet paper roll at all? They can tell you that it is better for the environment, but watch the price. Environmental claims sell product and it is up to the consumer to think through the process and the science just like the unintended consequences of antibacterial soaps and detergents. Hang on to some old containers, packages and toilet paper rolls and see for your self. Advertising and marketing do more than inform us the availability of a product. The work to shape our preferences and opinions “for the benefit of the manufacturer.” As an informed and responsible consumer, it is up to you to see past the marketing magicians’ slight of hand and possible misdirection to figure out what is really going on with the products they sell. Thank you for your VERY INFORMATIVE Post!! I have a question. All I have is Dawn Ultra Platinum Advanced Power from Costco. CAN I USE IT NOW ON MY ANIMALS, DOG and CATS??? All dish detergents are highly alkaline and can irritate the skin and eyes. I do not recommend using dish soaps as regular pet shampoos since they can cause dermatitis and eye irritation. A better method would be to use a baby-wash to clean the coat and then apply a topical spot-on flea treatment afterwards if fleas are a concern. I looked at the MSDS for several versions of Dawn including your Advanced Power version from Costco. They all explicitly state to not get the product in the eyes. There is nothing about the Advanced Power that makes it more hazardous than the other varieties. I doubt this is true. For one thing, if there were different chemical versions of the product, by law they would have to have a separate MSDS for each formula. I only see one MSDS for blue Dawn Ultra and one for the blue Simply Clean version. Also, If Dawn had California-prohibited ingredients, it could not be considered safe under Proposition 65. But the latest MSDS documents for both blue versions state that Dawn “is not subject to warning labeling under California Proposition 65.” So I must conclude that the same version is sold nationwide. Brilliant article! I wanted to find out about enzymes in Dawn for purposes of making laundry detergent. Now that I know what to use as a pre-soak for those pesky gym and gardening clothes. Thanks. I agree that Dawn is no longer the product that the original one was. I use twice as much and it is not as effective. I am now looking for a replacement after being a “Dawn” user for about 20 years. This is great info. The only unanswered question I have is where is Dawn Dishwashing Liquid made now days? The label only says distributed by P & G, Cincinnati, Ohio. What happened to dawn platinum foam Lime surge? Obviously people loved it. There are a few remaining bottles selling on ebay and amazon for $10 to $25 a bottle. We want it back. Much better scent than the blue stuff. I think it even works better. I’m 72 years old. I remember when Dawn was introduced. If I remember correctly (and I believe I do) it’s advertising claim was that it would quickly get your dishes squeaky clean, implying that other dish-washing liquids require much rinsing before they became squeaky clean, so Dawn would save you time, effort, and water. This claim appeared to be true, but I believe (conjecture only) due to addition of an ingredient or ingredients that produced a physical squeak due to the ingredient(s) remaining on your dishes even after rinsing. This resulted in the dishes squeaking after much less rinsing than after other detergent use. Dawn sales quickly increased, at the expense of other detergents’ sales, so much so that the other detergents eventually changed their formulas to mimic the squeaky clean effect of Dawn. My decades-old question is if my conjecture is true, what effect, if any, does the addition of a squeaky clean chemical or chemicals to Dawn, and eventually to other dishwashing liquids, have on our ingesting such chemicals as they remain on the squeaky clean dishes. Please note I have no proof of any of this, just assumptions based upon personal observation. I’ve scoured the web for pertinent information and have found none. Have you run across any such info? Thank you. I don’t believe that Dawn has any chemicals that remain on the dishes after proper rinsing. A clean silica surface has a high coefficient of friction which results in it having a “squeaky clean” feel. This squeaky clean feeling goes away in time as the surface of the dish adsorbs environmental molecules. Silica surfaces adsorb environmental molecules readily. I believe the reason Dawn may have historically created a superior squeaky clean effect is that it contained solvents that other dish soaps did not have. One such solvent that is still in there today is ethanol. Ethanol and other organic solvents are really good at stripping grease and contaminants from the dish surface and will produce a squeaky clean effect more readily than soaps or detergents will. So maybe the chemical you are thinking of is ethyl alcohol, also known as ethanol. Ethanol is water-soluble and rinses off easily. It is also the same alcohol that is in wine and other alcoholic beverages. I just don’t think there is anything to worry about as far as any type of chemical being left on the dishes. I’ve got a granddaughter that uses soap (Dawn) like it won’t clean the dishes unless its blue. I’ve told her it only takes a small amount. We use it in pump bottles in the bathroom and porch for washing our hands, there again I’ve told her about the small amount. I need to know the ratio for Dawn to water for dishes, for washing hand etc. It should only take a few drops of Dawn Ultra on a sponge to wash a small sink load. I don’t recommend using Dawn as a hand soap. It can dry the skin. Amanda uses baby wash as a hand soap to keep the skin on her hands moisturized. Your daughter is correct. Dawn stinks now. A ‘few drops on a sponge’ will not clean a dish. It is not the same product as it used to be. Thanks for the informative post. Is there anything secret or proprietary about Dawn ultra or are there other generic soaps from other brands that are at least almost identical? Proctor & Gamble continually registers patents for many of their products. Dawn has been protected under several patents over the years. As the patents expire, improved formulas with new patents are created. So I would say that although not necessarily secret, some of the ingredients or manufacturing processes are possibly patented at any given point in time. In Toronto Canada, Dawn dish liquid had a different name. I was wondering if anyone would know of the original product name? When I look at Walmart Canada and Costco Canada, they both offer the Dawn brand. I have a brown composit sink. Is it ok to use Dawn Platinum Bleach Alt.? I stumbled on your page. Great info on Dawn! I’m looking for the best one for degreasing bones (for my work). Many taxidermists just say “Dawn”, but there are so many! I have 4 two week old kittens with fleas. Regular flea medicine and flea shampoos will kill a kitten. Which Dawn would be the safest to use on these kittens? I need to do something soon. I would use the Dawn Gentle Clean. It might not irritate the skin as bad. Here is a link where a vet recommends Dawn. I accidentally came across your posting of Dawn, as I was Google searching for the P&G difference of Dawn Ultra and Dawn Professional and I am thankful for your time and energy on this topic. Like many of you out there, I’ve been a loyal Dawn user since it came on the market, and have learned much through trial and error, which Dawn is better or worse than others. I have learned through the years, that Dawn Blue is a must for stain removal on clothes, as other Dawn products, leave traces of the color on the fabric, especially white items. Dawn with added colors and scents isn’t the Dawn you want in your cabinet for overall cleaning needs. And I have now discovered that the Dawn Professional is a watered down version of Dawn Ultra. I just bought the one gallon jug of Dawn Professional, at Staples, with a price match, thinking I would be getting a better deal. However, I was truly disappointed at how much detergent has to be pumped onto the sponge for just one dish! I thought this gallon jug would last me a couple of years in this 1 person retired household, that also averages two dishwasher loads a week, and at this rate I’m going through the Dawn Professional, I’ll be lucky for it to last 3 months! Like all of your other readers, why mess with something if it’s not broke? I loved the Original Dawn Blue and wished it was back. Seems to me, money spent designing new bottles, scents, etc drives up the cost. Save P&G and the consumer some dollars, and manufacture the one and only true original Dawn Blue and see your shares go up and happier customers too! I am looking for the original Dawn but I’m sure they don’t sell it here in Costa Rica. I am looking for it because a weed killer recipe I found claims that vinegar, epsom salts and original dawn will kill the toughest of weeds as well as Monsanto Roundup which is toxic to humans. The purpose of the Dawn is to act as a surfactant. This makes the mixture spread out and stick to the leaves instead of forming beads. It is the vinegar and Epsom salt that is actually killing the plant. I prefer Dawn Free and Clear as the fragrance in the blue bottle gives me a headache. Wouldn’t the strong perfume smell be bad for little birds? Is a milder, fragrance free version actually the one used on the birds? I’m sure Free & Clear would be the best choice but people have saved the lives of many oil-damaged birds with the regular blue Dawn. In San Diego CA the Dawn Professional can be found at the Business Costco only. We only have one business Costco in the area . It caters to businesses but anybody with a card is welcomed to shop.